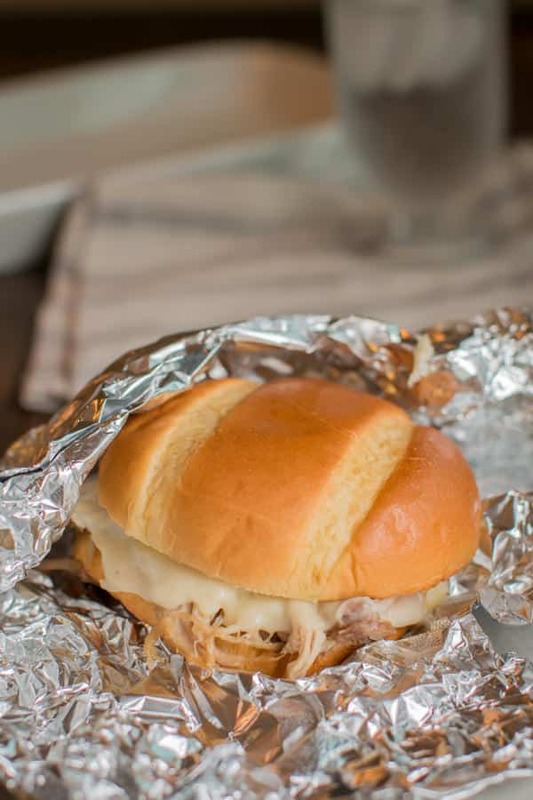 These Slow Cooker Cheesy Cajun Pork Sandwiches are amazingly delicious! 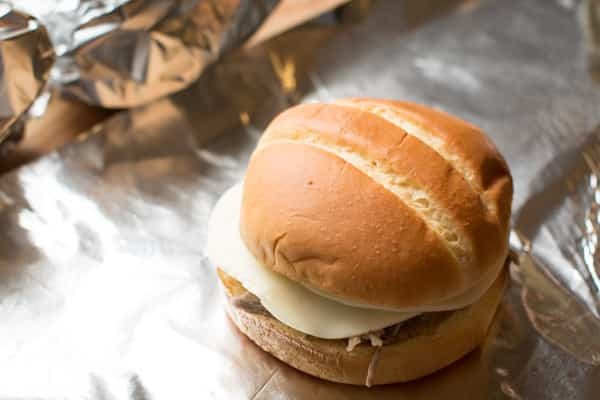 The sandwiches are warmed in the oven so the buns get toasty and the cheese gets melty. Hi all! I love a good pork sandwich, but barbecue pork can be so boring, it seems to be on every restaurant menu. 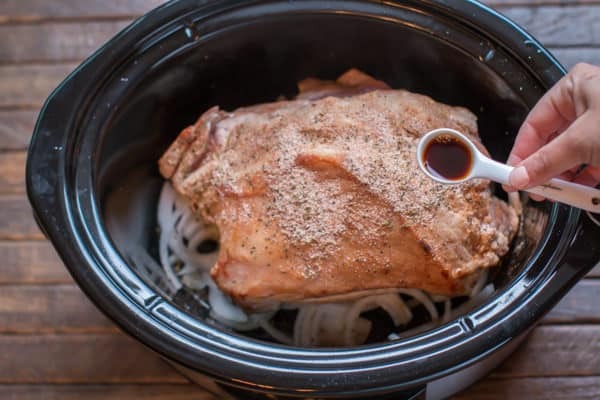 I made a delicious Cajun seasoned pork in my slow cooker. 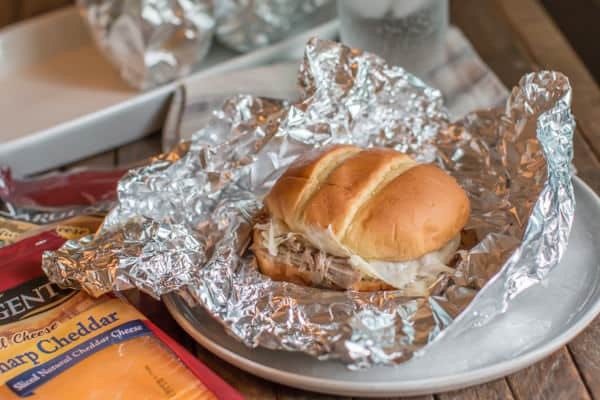 Then I took it to the next level by adding Sargento® Sliced Cheese on top of the pork, then wrapped the sandwiches in foil and warmed them in the oven. I start with a large pork shoulder that I brown on the stove top. I lay that on a bed of onions, then I add seasonings to flavor the pork Cajun style. I add a touch of Hickory liquid smoke, and a cup of chicken broth. 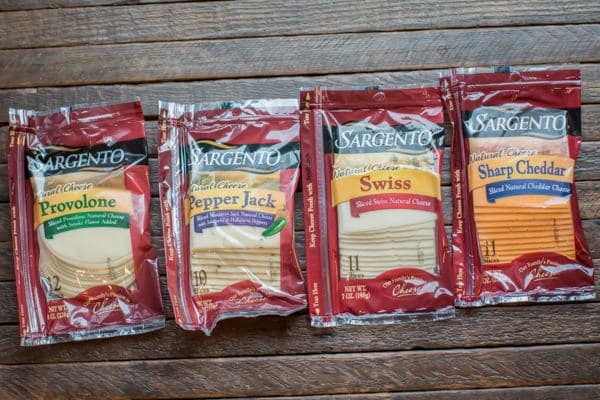 Below are some of the choices of cheese slices from Sargento®. For this recipe I used Provolone and Sharp Cheddar. Sargento® cheese is 100% real natural cheese, unlike American single slices (Pasteurized Process Cheese Food) which are required to only have 51% real cheese in them. This real cheese goes so good with the pork. This meal goes together so quickly after the pork has cooked. It is a great recipe if you work all-day or have busy weekends like we do. There are so many other great sliced cheese choices from Sargento®, which cheese would you chose for this meal? 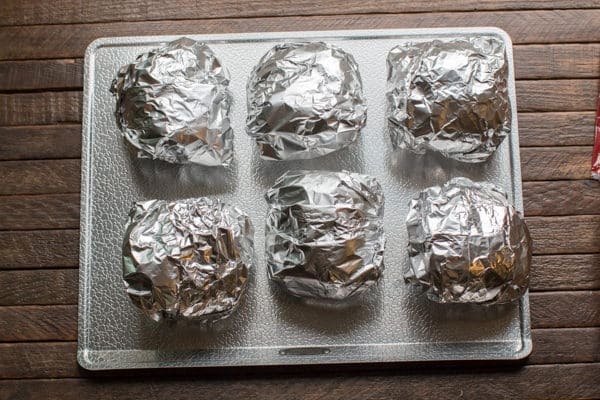 After the sandwiches have been assembled I wrap them in foil. I place them on a baking sheet, and put in a pre-heated 425° oven, and bake for 15 minutes, or until the cheese is melty and the buns are toasty. 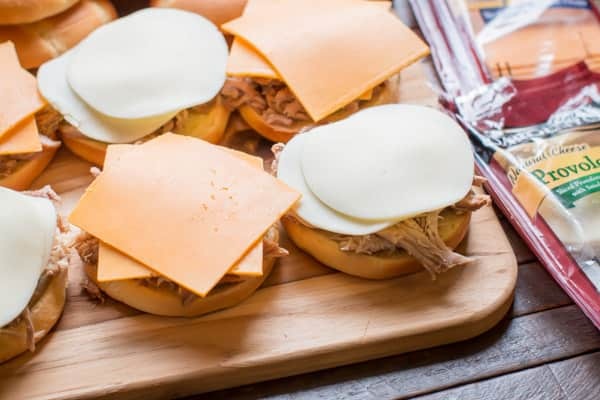 As you can see these sandwiches turn out great with the help of the Sargento® 100% real cheese. I keep this sliced cheese on hand for my day to day needs, it goes great on a breakfast burrito, on a sandwich for my husbands lunch, or for a drool worthy dinner like this recipe. I hope you try this recipe and use Sargento® sliced cheese, you will love the way it turns out. You can find more reasons why to choose real cheese here, and if you’de like you can follow Sargento® on Facebook, or Instagram. In a large skillet set to medium-high heat, add the cooking oil. When the oil is hot, brown the pork shoulder on all sides. Add the onion down in the slow cooker. Add the browned pork on top of the onions. Add the liquid smoke, and chicken broth (or water) around the pork. Cover and cook on high for 7 hours or low for 10. When the cooking time is done, remove the pork on to a plate, shred with two forks and discard fat. 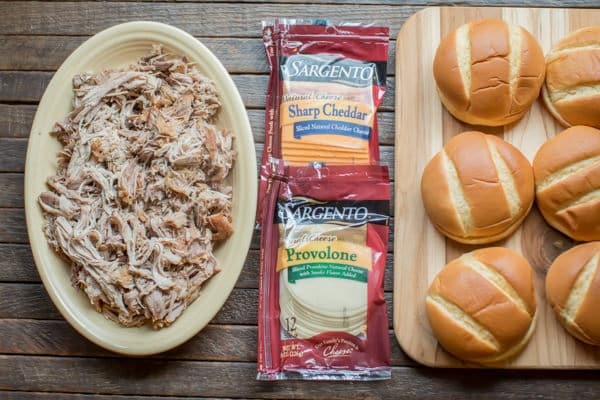 Add meat to each bun bottom and top with the Sargento® Cheese, I use 2 slices per sandwich. Add the tops to the sandwiches. 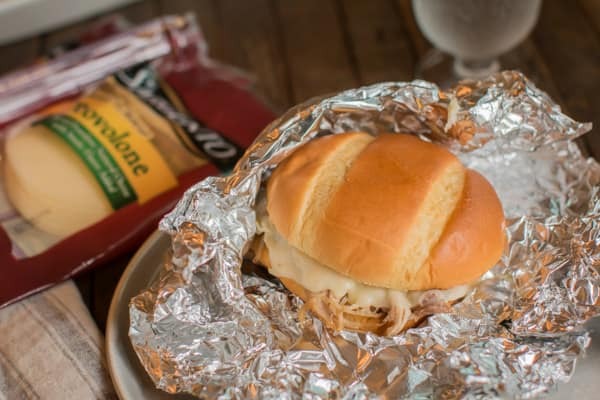 Wrap each sandwich in foil. 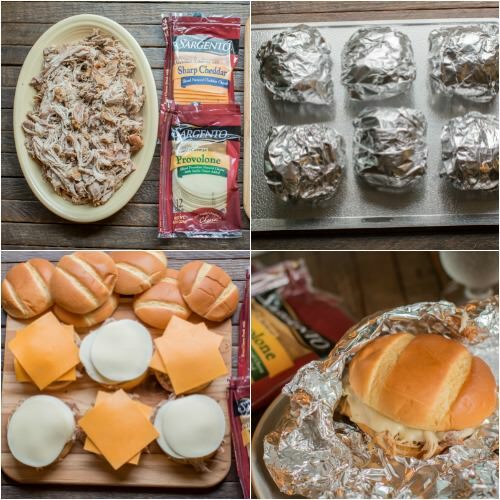 Place the wrapped sandwiches on a cookie sheet. Place in oven for 20 minutes, or until the cheese had melted and the bun is toasty. Serve and enjoy! Made this exactly as written and the meat was very flavorful. Even got a thumbs up from the hard-to-please hubby! Could even be used over rice or noodles or even as nachos! This looks yummy! 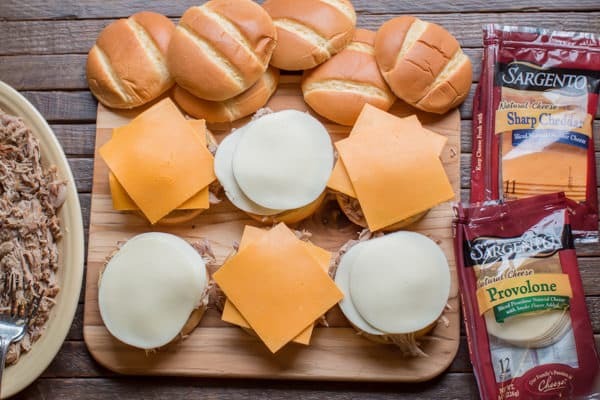 Can’t beat cheese and pork together. 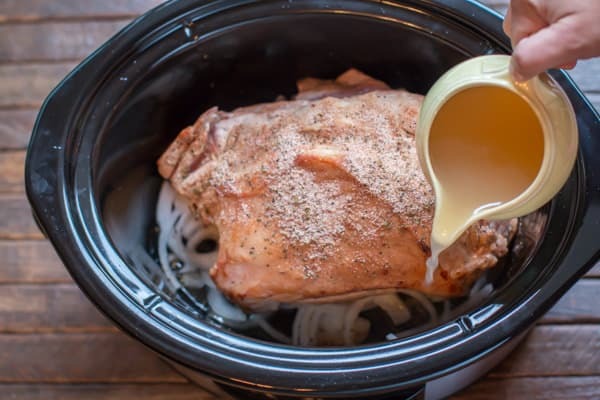 I made pulled pork last weekend in my slow cooker = delicious.